As anyone who has ever choked down a chalky nutritional drink knows, getting those extra vitamins and minerals your body needs is a bit of a chore. And it’s repetitive—the daily scoop and blend and chug routine can make your tastebuds feel like they’re in some kind of dietary Groundhog Day. A girl can only drink so many smoothies. Thankfully, nutritional supplements have come a long way in recent years. From powders that—dare we say it—taste yummy, to oils and drops that can be added to pretty much any recipe, it’s never been easier to get your good health on. Need proof? Three pros who know their way around the kitchen dish up creative, delicious ways to add nutritious powders and potions to your everyday life. Because (shocker!) your supplements don’t work if they’re left to gather dust in your kitchen cabinets. Read on to learn all about their recipes of choice and what these 3 supplements can do for your body, mind, and taste buds. Cannabis has seen a major beauty moment lately as both an external and internal ingredient. Kerrilynn Pamer, co-founder of CAP Beauty boutique in New York City, notes that the reason behind this trend stems from the root of most health evils: inflammation. “CBD oil is such a beautiful way to combat inflammation that it seemed really logical for it to be something you use daily,” she explains. According to Pamer, CAP’s new CBD oil blend The Daily Hit lends itself to savory dishes, but is also pretty tasty in sweets—hey, cannabis brownies are cliché for a reason. As the oil itself is quite expensive, Pamer says that when using it in your recipes, only use the recommended dosage of one-half tsp. If the recipe calls for more oil, then use another oil to make up the difference. She also advises against boiling it (the adaptogens aren’t fans of the process) and when baking, to go no higher than 350 degrees. Outside of using it in salad dressing and green soups, Pamer says these chickpea pancakes with tahini are her current favorite way to get her CBD fix. 1. Add chickpea flour to a bowl with salt, berbere, pimenton, water, and 1 Tbsp olive oil while whisking to get rid of any lumps. Let soak overnight. 2. In the morning, stir to combine well. Heat a cast iron skillet over high heat on the stovetop. 3. Add 3 Tbsp olive oil and pour batter in. Cook over high heat for 5 minutes then transfer to the oven and cook for another 10 to 12 minutes till set in the center. 1. Add all ingredients to a blender and whiz to combine. 2. Flip your pancakes onto a plate and top with sauce, arugula, and olives. Wiesenberg started her food-as-drug journey with a homemade “power chocolate” made with coconut oil and the ingredients that now make up her Beet Bliss powder. “It gave me extra energy and great skin. I decided to put this blend inside the canister and allow people to create their own chocolate on-the-go with some superfood powers.” Get your cocoa fix with Wiesenberg’s simple and delicious original recipe. 1. Add Beet Bliss to coconut oil and, with clean hands, mix the two together until well-blended and smooth. 2. Separate the mixture into small, truffle-size pieces and roll together to make a ball. If you want to get fancy, put them in a mold to create a fun shape. 3. Place in the fridge for 30 mins, then remove and sprinkle with a pinch more of Beet Bliss. Naturalist and founder of The Beauty Chef Carla Oates believes so strongly in the link between food and health that she created an entire cookbook revolving on that premise. Her The Beauty Chef cookbook features recipes meant to aid digestion, hydrate your skin, combat fatigue, and address a host of other maladies. She also recognizes that, as lovely as za’atar chicken with cauliflower rice sounds, not everyone has the wherewithal to attempt it. 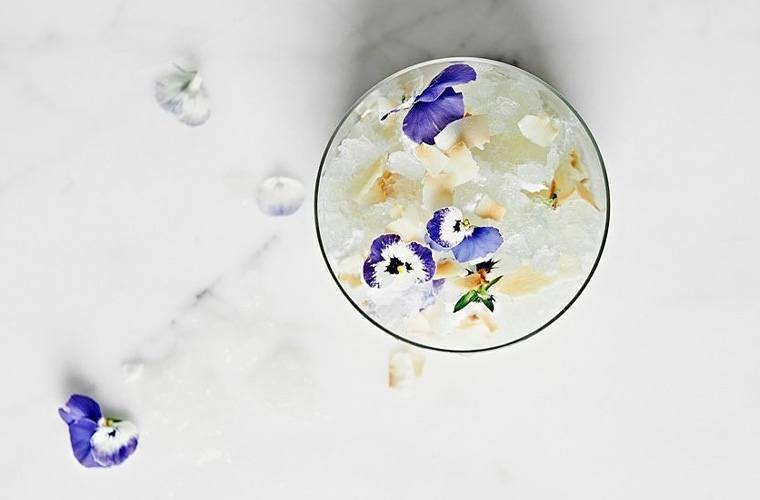 Which is why we like her spin on a granita, an icy dessert that’s crisp, refreshing, and all-around delightful. The addition of the Hydration Inner Beauty Boost probiotic shot gives you a dessert that both tastes great and does great things for your skin. 1. Combine the lime zest, ginger, and water in a small saucepan and set over medium heat. Simmer for 10 minutes, or until reduced by half. Set aside for 10 minutes to cool slightly. 2. Strain the infused ginger and lime water through a sieve lined with muslin cloth into a medium bowl. Gather up the edges to form a bundle and squeeze to extract all of the liquid and flavor. 3. Add the lime juice, coconut water, and Hydration Inner Beauty Boost and stir to combine, then pour mixture into a small, shallow tray. 4. Freeze for 1–2 hours, until frozen around the edges. Remove from the freezer and mix in the frozen edges. Return to the freezer. 5. Remove the mixture from the freezer every 30 minutes or so and mix it up. Once all of the liquid begins to freeze, use a fork to drag and scrape the mixture and break it up into small ice crystals. Repeat this over 3 hours, or until mixture is fully frozen into delicate ice crystals. 6. To serve, scoop into serving glasses or bowls. Drizzle with coconut cream and scatter with toasted coconut. Okay but, you still really like smoothies: Here are 9 that will give you glowy skin. And here are the supplements to take for thicker, fuller hair and healthy nails.